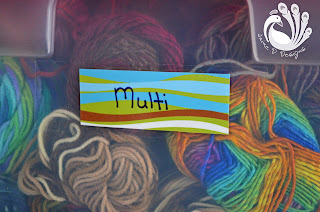 If you crochet or knit you will already know that yarn multiplies while you sleep. 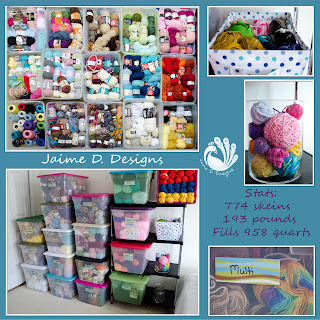 First you have just a little grocery bag, then you upgrade to a basket, then a tub and before you know it you have 16 tubs and some bags and a basket or two! 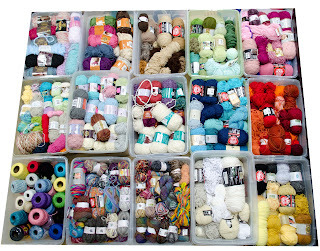 So how do you organize and sort all of this multiplying yarn?! 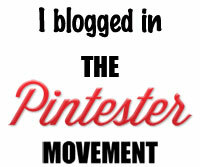 This is how I do it! 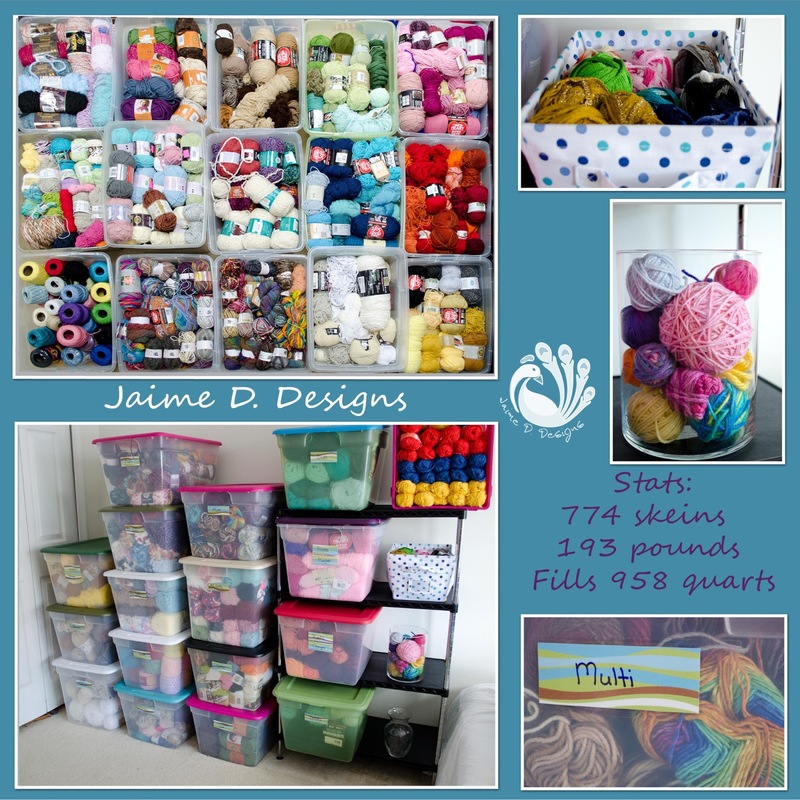 My yarn collection started small and has grown to over 774 skeins (last time I counted). That number has and will change from that as I use and buy more, but that's a whole lot of yarn!!! I even weighed each of my tubs! Combined, it is over 188 pounds! I sort my yarn by weight, color and brand. All of my worsted weight yarn is sorted by similar or very contrasting color. For example I have reds and oranges in one box, but yellows and greys/black in another and so on. I have 1 tub that has all Lion's Brand Hometown USA. I got a lot of it on sale during Black Friday. Until I use it all, it will just stay in it's own tub because there is so much of it. I have a tub for all Bulky #5 yarn and another for Super Bulky #6 yarn. Also the novelty fun fur yarns get their own box. 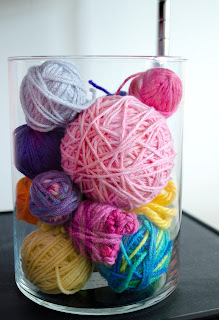 There are also tubs for the variegated yarns that have multiple colors in the skein. The colors I use the most I have put on the shelves so I can get to it easier. I also utilize these canvas storage boxes I got at Walmart on clearance for $3. They have a metal frame inside and hold up really well! The front of each of my storage tubs is a label letting me know what's inside. 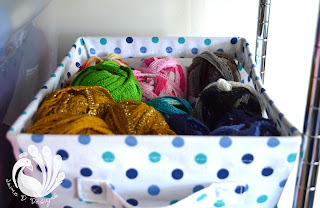 I find it helpful for the boxes that have the Bulky and Super Bulky yarn inside. So that's it! That's how I organize and store my yarn! Not necessarily pretty, but very functional for me!